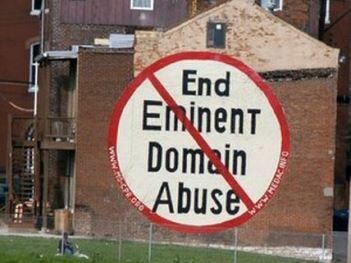 Eminent domain is one of the greatest government assaults on individual rights that one sees on a regular basis in the United States. Even in its purer form, in which land is seized for projects with broad general public benefit, such as a freeway or reservoir, it is often abused. But what appears to be the most common form of eminent domain in the U.S. is typically an appalling assault on liberty. As Justice Sandra Day O’Connor argued in her dissent in 2005’s Kelo vs. New London, it’s commonly used for reverse Robin Hood purposes — taking land from the poor (or poorly connected) and giving it to wealthy, connected developers. “These are immense obstacles. 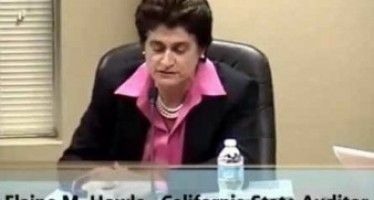 Yet instead of acknowledging their seriousness, rail authority board Chairman Dan Richard depicted them as predictable ‘challenges,’ and a spokeswoman said the authority would proceed with its plans to seize land for the project in the Central Valley via eminent domain. “This is in keeping with Richard’s full-speed-ahead bravado. But is also unconscionable — disrupting the lives and livelihoods of Central Valley residents for a project that is now an extreme long shot solely to create an apparition of progress. “Before this happens, it’s time for a ‘have you no shame?’ intervention in Sacramento. If Jerry Brown won’t take Richard to the woodshed, then it’s time for some senior Democratic leader to take Brown to the woodshed. In 2005, principled believers in property rights were very pleasantly surprised at the sharp backlash against eminent domain triggered by the 5-4 high court Kelo vote to continue to allow land grabs to help local governments increase tax revenue. 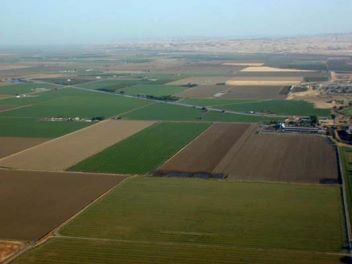 I think there’s a chance that if the rail authority starts seizing productive ag lands and neighborhoods of middle-class homes in the Central Valley for a project that appears dead, there would be another backlash, and not just in California. It wouldn’t just be an obnoxious assault on the property owners facing land grabs. It would be a hateful assault on American norms of fairness and honesty. lol— and u doomers were worried about this judge!  LOL—- what you don’t know fills a library……. It has Always been a land grab. Look at the moves, water project, get land get Monterey deposit and get the energy cheap pretty tidy package. Think of the Owens Valley in the 30’s history repeats. Global Warming, HSR a ruse to acquire the assets. Di Fi will no doubt be at the trough early along with the usual Quangos and special people. The people of California voted in the types of politicos who want to do this, they do this and you get upset? CA–and specifically Democrat pols in CA–continue to meander down the road to ruin. Sure, our budget is now balanced (ignore all the off-budget, special purpose spending). Sure, the $500B pension funding deficit can be filled by 8 percent fund growth (or more!). CA has an amazing ability to defy gravity, but it will be hugely amusing when it crashes back to earth. What will be particularly entertaining will be the rapidity with which High Tech and Hollywood liberals bail out when their wealth is finally squeezed, too. It will be glorious. I doubt if there are many “rich liberals” that are in the Central Valley, and that have property at risk – that was the whole point of routing HSR through the valley, and not along the PCH corridor. I seem to recall the original plan was to put the line in the median of Interstate 5, and a French company associated with their TGV bailed when that route was altered. 1) I-5 crosses the coastal range via Tejon Pass and the Castaic grade, both of which exceed 5% grades (some places as high as 7.5%), which are not feasible for railroad construction (steep rail grades are in the 2-3% range). Ideas of tunnels were shot down because it would require roughly *thirty two miles* of tunnels (plus a number of long elevated viaducts) crossing one of the most major earthquake faults in the state. The current routing along CA-99 & then out through the Antelope Valley is the traditional rail route because it is the most practical to build…as the Southern Pacific discovered in the 1860s & 70s when they connected the Transcontinental railroad at Sacramento to Los Angeles. 2) I-5 follows the West side of California’s Central Valley, while all the significant cities and towns are on the East side. (primarily Bakersfield & Fresno, but there are others) A routing along I-5 fails to serve 95% of the population in the Southern Central Valley. A routing along I-5 fails to serve 95% of the population in the Southern Central Valley. As I recall, that’s not how it was pitched to the CA public when it was being proposed. It was supposed to be a high-speed link between the Los Angeles basin and the Bay Area. I propose an alternative to the land-grabbing high-speed rail project: high-speed submarines between SF and LA. All the same speed, all the same cost, but travelers won’t be forced to go through Fresno unless those central valley politicians have some real clout in Sacramento. When will people, including politicians, learn high speed rail is never going to compete successfully against airlines without high levels of subsidies. Look at this article’s particular idea. It’s 300 miles along the great circle route from LA to SF. A typical airliner will get there in under an hour. A train will almost certainly have to take a longer route (as a previous poster mentioned, railroads need nearly flat terrain; high speed ones need them even more so, along with very high radius curves). Assuming 180 MPH, and assuming a 360 mile route (the route by highway is 380, I’d bet a rail route would actually be longer), the trip will take 2 hours, assuming no stops. Of course, every town of any size along the route will want a station. Each stop will add 30 or so minutes to the trip. So the train will be unable to compete in terms of travel time even for a nonstop trip, probably even if the time spent in both terminals are added (currently, getting on a train in most places is quick and easy compared with getting on a plane – no TSA involved in boarding a train – yet). According to the US Department of Energy, the BTU / pax mile for a train is 2,435 while for a plane it is 2,826. So a plane’s fuel costs would be 16% higher if the rule costs were the same, but jet fuel is currently $3/gal, and diesel is $3.60/gal (although trains may pay less due to different taxes). so it looks like fuel cost per pax would be about the same. But the real killer for the train, and why it will never be economical compared with airliners as long as jet fuel’s cost isn’t hugely higher per power produced than diesel is airliners do not have to buy, build, and maintain the roadbed (air) between their terminals; trains do. So, trains will take twice as long as an airliner, will have about the same cost in fuel, but will have more infrastructure costs because you’ll need 720 miles of roadbed (dual track main) whereas the airline needs about 8 miles of runways and taxiways. Want to extend travel to an additional city so there are three cities involved? One airport will do it, and allow direct travel from any of the three cities to the other two. But the railroad now needs two more sets of dual track roadbeds to do the same thing. And the final proof that the high speed train cannot compete with airlines: It’s already been done. High speed rail cars and locomotives already exist, anyone can buy them. How to construct their roadbeds is known, so nothing needs to be invented there. All someone has to do is buy the land (or have the government steal it for them), and build it and start operating it. So why don’t all those smart rich people (it’s hard to get rich if you’re dumb) in CA form a company to do it? Could it be because they don’t think it’s viable either? Why do I have to subsidize it via my federal taxes? Could it be because even government idiots know it can’t compete? So if even the government types who want it know it can’t compete with airlines, and to have any chance at continuing to operate it will need to be subsidized forever because it will never be able to support itself on ridership (like Amtrak can’t), why do they support it? Could there be some other agenda they’re supporting in secret? Like which of their relatives will get the contract to build it, or operate it? With guaranteed income provided by the taxpayers? Nah, that couldn’t have anything to do with it. I’m just a cynic. Kelo vs. New London and Citizens united are the two worst SCOTUS decisions in the last 50 years. Kelo is particularly disturbing b/c it allows gov to steal from the poor and hand over land of the rich, as in millionaire and billionaire developers. Is California Betting on Asia?